Despite the growth of the internet and paperless way of communicating and doing things, it is still hard to completely shun printed material. It is a strong medium of communication and it will continue to be that way many years to come. If it were not for the print media, the truth of the matter is that we would not be where we are today. That’s also a reason why there are still magazines and publications that are being published to date. 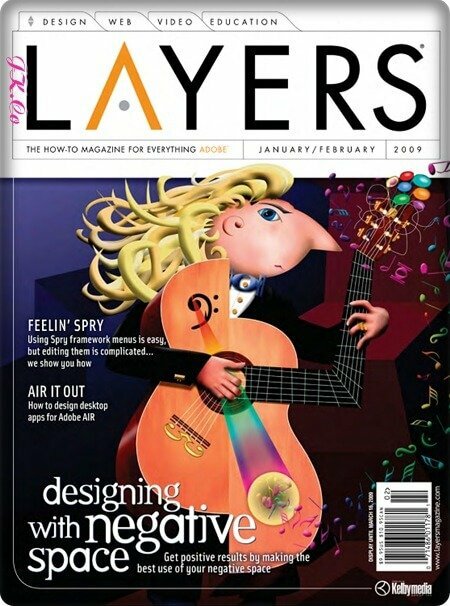 Layers magazine is published six times in a year and it is the go to resource for someone who is looking for insights from experts, detailed tutorials and pages upon pages of all suites included within the Adobe Creative Suite®. The suites include Flash®, After Effects®, Premiere Pro®, Illustrator®, InDesign®, Dreamweaver®, Lightroom®, Photoshop® and Acrobat®. Layers is the ideal magazine for people who want to learn more about designing ideas and want an inside scoop on new digital editing tricks and a lot more. The magazine also runs detailed portfolios for different people and general product reviews. It also carries relevant and newsworthy pieces and is therefore a must read for any professional in the web designing industry. This magazine is the first U.K publication targeted to the people in the field of online authoring. The biggest target audience are the trendy professionals aged between 20-35. Most of the content that runs on the magazine is in a tutorial format and they cover Photoshop, Dreamweaver and Flash. If the magazine was all about tutorials it would not appeal to this age bracket so they have softened that a bit by offering their readers current news about the industry and they also throw in a few features. The magazine seeks to instill inspiration about working with new and exciting media software and it would be right to say that it is the only magazine of its kind in the U.K.
What’s more, the .NET magazine packs a CD that has on it video projects, templates, full softwares, tutorials and so much more. With every publication, the magazine showcases the best websites on the internet and it also addresses pertinent issues that web developers and designers are faced with at the time. This is the perfect magazine for professionals who use Photoshop® Creative. It gives the reader helpful tips and tricks that can help one get the best out of the application. The magazine essentially covers the A to Z of Photoshop®. Every issue of the magazine also carries with it a detailed CD-ROM. As long as you have need for Photoshop in your day to day job and life, then you will be happy to know that there is a magazine out there that was tailored just for you and your needs. This magazine focuses most of its pages on helping designers to create impeccable designs. Anyone who runs a creative studio or works as a designer in a company should definitely have a copy of How Magazine. The magazine strives to address the needs of creative, business minded and technologically savvy individuals. It’s a mash up of business acumen, creative tips and technological news and influences. It showcases newsworthy pieces and goes a step further to show the reader why the projects were successful. The first edition of the How magazine was published in 1985 and since then it has grown from being just a print medium. Now, it holds yearly competitions, holds events and produces book and digital content as well. It would be correct to call the Computer Arts Magazine the one stop shop for all information about illustrations and digital art. The magazine is internationally recognized by designers and digital artists and always runs a detailed tutorial in every issue. The tutorials cover practically everything there has to be covered in Illustrator and Photoshop. It doesn’t end there. Computer Arts magazine also has a wealth of knowledge and tricks for web designers and has content educating its readers on animation, 3D, typography, multimedia and motion graphics. Definitely a good read if you are looking for a professional opinion. This is the best magazine for someone who wants to brush up or polish up on what they already know about Photoshop. It helps the reader horne their Photoshop skills and learn new tricks in the process. It is a definite must have for Photoshop enthusiasts and professionals who use it on a regular basis. There is no other magazine that can match its high quality and content when it comes to Photoshop. With every new issue, readers can advance their Photoshop skills and learn from masterclass tutorials. The main aim of this magazine is to give its reader a chance to fine tune the skills they have already acquired. This is the one and only magazine that gives its readers a creative side of things. The magazine itself is a spin off of the Computer arts magazine and it is published every month. The magazine focuses mainly on the creative and topics covered in its pages include web design, how to start a design or web design business, print design, typography, Photoshop and packaging. The magazine also runs easy to understand step-by-step tutorials put together from the best of the best in the business. It also runs full length profiles for the up-coming designers who exhibit lots of talent as well as those who have been in the business for many years and still continue to be successful. The title of the magazine just says it all really. If you are that person who wants to venture into the field of web design or you are just curious to learn what web design is all about, then this little piece of gem is a must have for you. The use of animation as a form of communication cannot be ignored. It is in fact on the rise and every professional needs to know how to include animation as part of their web developing projects. Having the technical know-how on how to animate could place you a notch higher above the rest. If you want to stand out from the rest as a web designer then this little notebook is a must have for you.